Play Rock Band, fight Hodgkin's disease! 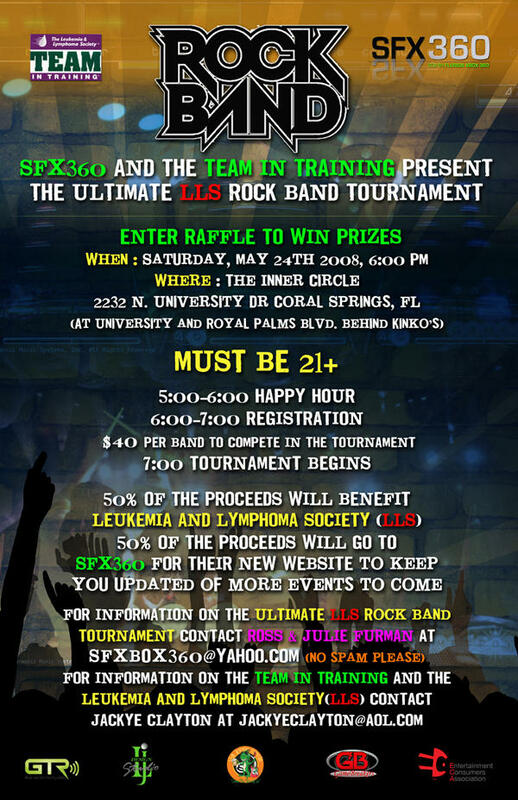 That’s right, May 24th the South Florida Xbox Meetup Group is planning their 2nd rhythm game tournament, this time featuring Rock Band, to benefit the The Leukemia & Lymphoma Society. I made mention of the first tournament they put together, but I want to do my part to make sure the word is getting out. True, if you’ve been on GamerTagRadio you’ve probably already heard, and if you’ve been here and not GTR, I must be doing something more right than I ever expected! Still, if you live in the Ft. Lauderdale area, make it a point to make your way to this event. Big names, and more entertainment than you can shake a Wii Remote at. Microsoft and Xbox 360 donates on a large scale!